Crock Pot Garlic Bacon Chicken - Recipes That Crock! Bacon. Chicken. Garlic. What’s not to love?! 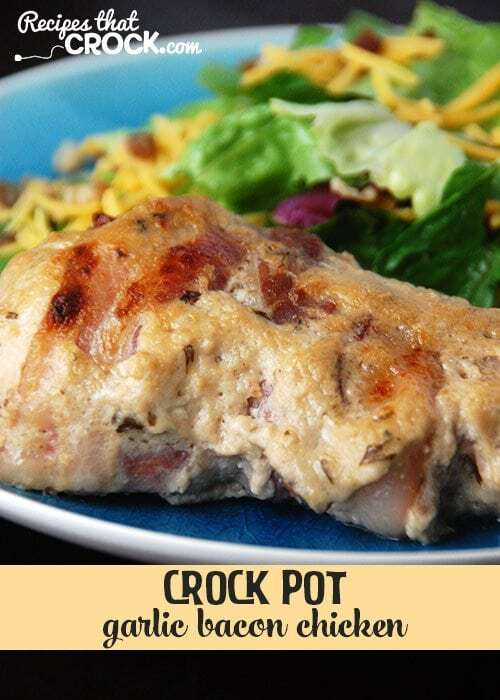 This Crock Pot Garlic Bacon Chicken is a cinch to throw together and amazingly delicious! 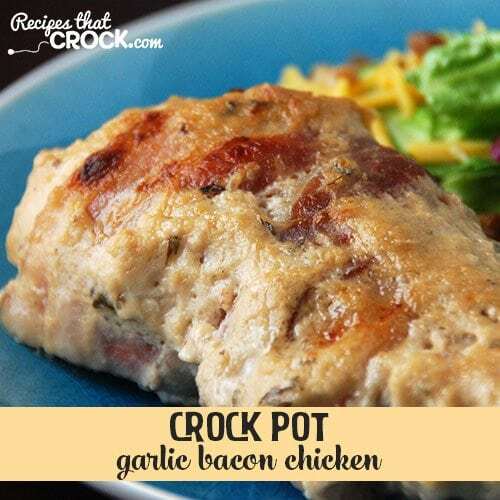 This Crock Pot Garlic Bacon Chicken is from Gooseberry Patch’s Everyday Slow Cooker. We all know that I love just about any recipe that can be thrown together in 5 minutes or less. And, when that recipe produces a mouthwatering main dish that has your family smiling, that make this Momma really happy! I had some HUGE chicken breasts, so I ended up using only 5 chicken breasts, because I cut the extra large breasts in half. So you will need to make the call based on the size of your chicken and your needs. The recipe said that broiling the chicken was optional, so that is how I put it in the recipe card, but let me tell ya people…you want to broil the chicken and crisp up the bacon. YUM! I used my 9 x13 casserole slow cooker made by Crock Pot. It was great for making sure all of the chicken was laid out in one layer and evenly covered with the soup mixture. If you aren’t using a casserole crock, I would recommend a 5-6 quart crock pot since there is so much food in this recipe. A delicious chicken breast recipe that is perfect for a busy week day! The recipe said that broiling the chicken was optional, so that is how I put it in the recipe card, but let me tell ya people...you want to broil the chicken and crisp up the bacon. YUM! I used my 9 x13 casserole slow cooker made by Crock Pot. It was great for making sure all of the chicken was laid out in one layer and evenly covered with the soup mixture. If you aren't using a casserole crock, I would recommend a 5-6 quart crock pot since there is so much food in this recipe. Can you cook this on high for 3-4 hours for a quicker cook time? Where’s the garlic? There’s no garlic in this recipe so the “Garlic Bacon Chicken” title seems wrong. The garlic is in the soup, but if you want to add garlic, that would be a great idea! One can never have too much garlic! Enjoy! my husband doesn’t like sour cream – what can I substitute – he doesn’t like yogurt either, in case you were to mention that. We have quite a few recipes we have made in our casserole crocks (with more to come!). I’ll put a link to the page below. That way you will have plenty of ideas when your casserole crock arrives! Enjoy! Do you dilute the soup with water? Haven’t made this yet but plan to this weekend. Curious as to why the flour is necessary (trying to get healthy!). Really excited to learn about the rectangular crock, too! I think the flour is to help thicken up the gravy. I just followed the recipe. If you try something else and like it, be sure to let us know! Enjoy! This looks awesome! I am wondering if it is best to broil the chicken before putting in the crock pot or after it is done before serving? You’ll want to put it in the broiler right before serving to crisp up the bacon. Yum! Enjoy! Thank you! Looking forward to making this one! I hadn’t heard of it either before this recipe. I found it at our Jay-C Store. It was a Campbell’s soup. Hope that helps! Enjoy! How much flour, 1/2 ? A half a cup. The recipe is fixed. Enjoy! You say that we need 1/2 of flour? is it 1/2 cup? I see they must have corrected it as the recipe does say 1/2c. Yes, a half a cup. The recipe is fixed. Enjoy!